CALGARY, AB--(Marketwired - May 25, 2016) - A trailblazing online search engine that will save researchers years of time while conducting meta-analysis will be unveiled next week at the University of Calgary. After four years of development and testing by three founding institutions -- the University of Calgary, Virginia Commonwealth University and the Northern Alberta Institute of Technology (NAIT) -- the search engine metaBUS is now fully available to researchers around the world. Its creators believe it is the largest collection of curated, published research findings of its kind. "By using metaBUS, summarizing research will now only take minutes rather than years and puts the focus on curating new knowledge rather than trying to sift through past findings," says co-founder Piers Steel, distinguished research chair in advanced business leadership at the Haskayne School of Business. Academics currently spend months or even years combing through published research journals to do meta-analysis -- the process of summarizing past findings in a given field -- as they conduct research. The team behind metaBUS has coded nearly one million journal findings, dating back to 1980, into metaBUS in the fields of organizational psychology and human resources. Instead of manually finding, reading and summarizing journal articles, metaBUS users will be able to create field level summaries in real time by classifying metadata to achieve a never-before-seen level of research curation. MetaBUS is free for registered users and includes some data from journal articles that are currently locked behind subscription paywalls. Co-founder Frank Bosco from Virginia Commonwealth University said metaBUS's ambitious goal is to change the speed and collaboration of science. "MetaBUS expands the scope of academic research to an unprecedented size and scale and, we believe, will enable scientists to answer large-scale calibrating questions that were previously impossible to address," said Bosco. It has already been hailed as a world-leading idea by the Association to Advance Collegiate Schools of Business as a top Innovations that Inspire and winner of the 2013 Digging into Data Challenge. Krista Uggerslev from NAIT, a metaBUS co-founder, says the group is eager to show off metaBUS and hopes interested users will sign up to use it. "This project was a significant undertaking in open science – helping to make research findings more accessible to public policy decision makers, business leaders, and for the public understanding of science," said Uggerslev. MetaBUS was developed with funding from around North America including the Canadian Centre for Advanced Leadership in Business at the Haskayne School of Business, the National Science Foundation, the Social Sciences and Humanities Research Council, the SHRM Foundation and the VCU Presidential Research Quest Fund. The Haskayne School of Business was founded at the University of Calgary in 1967, and was named in honour of Richard F. Haskayne, OC, AOE, FCA, in 2002. The business school has approximately 3,400 full- and part-time students enrolled in bachelor's, master's, doctorate and executive education programs, and stays connected with its more than 22,000 alumni in 80 countries worldwide. The vision of the Haskayne School of Business is to be an internationally recognized centre of excellence for business education, research and community outreach, with a special emphasis on the distinct elements that define Calgary and Alberta: energy, entrepreneurship and ethical leadership. 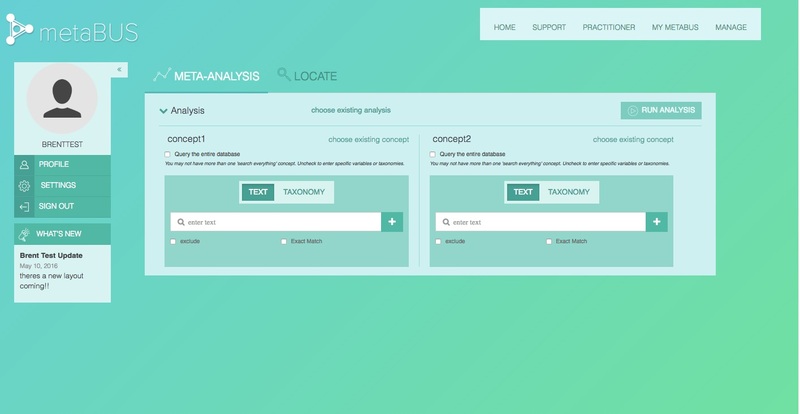 The interface for metaBUS, a new online search engine that performs meta-analysis in minutes.